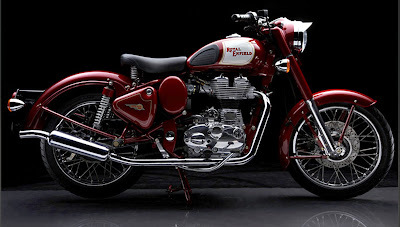 Royal Enfield India offers an attractive gallery of pictures of its new Bullet Classic, unveiled this morning in Germany. The picture above seems to show a crease across the top of the tank but that must just be a lighting effect; it doesn't show in other pictures. 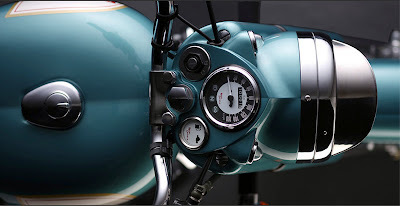 Also not shown is a kick start lever or rear-view mirrors. Perhaps they just wanted to clean up the looks of the bike for pictures. But we do see an odometer and fuel gauge. A note at the bottom of the web site notes that the up-swept exhaust shown in some of the pictures is optional, and for off-road use only. Color options shown are black, red and pastel green. Hi David, nearly missed all the news on the new Classic Bullet release, until I took a look at your blog! 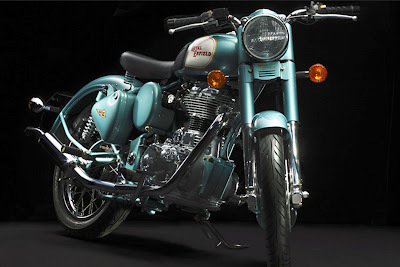 I like the look of the bike, and the website for it is cool, too! Hope you don't mind me using some of your text, with a reference/link to your blog.